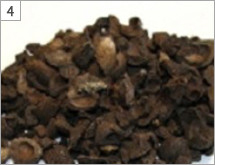 Palm kernel shells, or PKS, are the shells that cover the seeds of oil palm fruits. Oil palms are cultivated in overseas countries to extract palm oil from the pulp of the fruit and other substances from inside the seeds. The shells that remain after the oil has been extracted are called palm kernel shells (PKS). Oil palm fruits are different from coconuts, which are larger fruits found on coconut palms and used for making coconut milk. 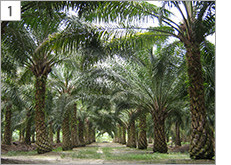 Oil palms are planted and grown until they bear fruit. 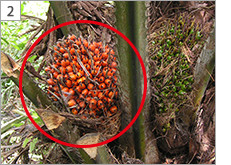 Oil palm fruits on the trees are harvested. The size of a cluster is about the size of a watermelon, and they weigh about 20 kilograms. Several tens of fruits are produced, and the size of one fruit can range from that of a Japanese chestnut to a chicken’s egg. Seeds are inside the orange pulp. You can see kernel seeds inside as well. 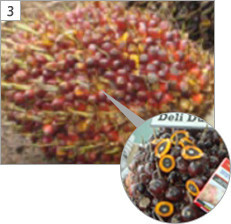 “Palm oil” for cooking is extracted from the pulp, and “palm kernel oil” used for processing is extracted from the kernel. These hard, walnut shell-like parts of the fruit are dried and crushed to produce palm kernel shells (PKS). They have hardly any odor. PT. 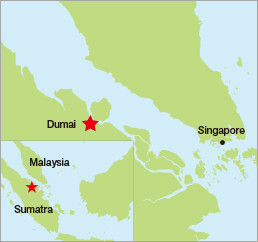 New Energy Development Dumai was established in Dumai, Indonesia in 2012 as a wholly-owned subsidiary of the New Energy Development Co., Ltd. We have entered long-term purchase agreements with local plants in Indonesia and Malaysia, two of the world’s largest producing areas of palm oil. Only the palm kernel shells (PKS) supplied by these plants that have passed our quality standards are exported as fuel, enabling a stable supply of PKS. 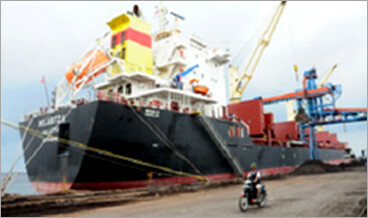 Palm kernel shells are exported to Japan in large cargo ships. Purchasing, quality control, export sales, and operation of palm kernel shells (PKS) stock yards. ※ Written in the order according to the Company Law of Indonesia.